Global wind patterns develop as the result of subtropic and subpolar highs and lows and the rotation of the earth. The Coriolis effect deflects winds to the right in the Northern Hemisphere, and to the left in the Southern. At the equator: Warm air rising at the equator causes a low pressure region here, which draws winds in. This region is also known as the InterTropical Convergence Zone because winds and currents approach from either side of the equator, causing fluctuating conditions at the equator itself. Yet another term for this region is the Doldroms, as there is little wind because most of the air movement here is vertical rather than horizontal. From 0°-30°: The prevailing winds in this region are from the East and are known as the Trade Winds (the NE Trades in the Northern Hemisphere and the SE Trades in the Southern). Air from the Sub Tropic High blows toward the Equatorial Low and is deflected to the East by the Coriolis effect. At 30°: Also known as the Horse Latitudes because years ago when sailors were trapped in this region of little wind, they threw their heavier cargo (ie. horses) overboard to try and lighten their load. This Sub Tropical High Pressure Zone sees little wind as most air movement hear is vertically downward. From 30°-60°: The prevailing winds in this region are known as the Westerlies. Winds blow from the Sub Tropic High toward the Sub Polar Low and are deflected to the West by the Coriolis effect. In the Southern Hemisphere, the region between 40°S and 60°S is known as the Roaring Forties. Prevaling winds in this region are unusually strong because this belt continues all the way around the earth without being interrupted by land. At 60°: This belt is known as the Sub Polar Low sees little wind as a result of warmer upwellings of air traveling vertically rather than horizontally. 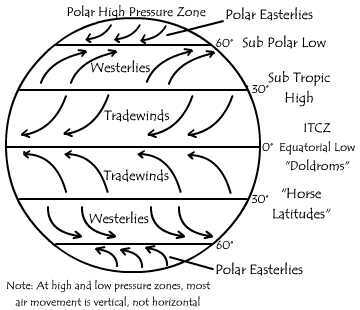 From 60°-90°: Prevailing winds in this region blow almost directly from the East because as winds blow from the Polar High to the Sub Polar Low, they are greatly redirected by the Coriolis effect, which is very pronounced at this latitude. At the Poles: The Polar High Pressure Region is the result of a vertical downdraft of air as it cools above the colder Polar regions. Winds here are primarily local and are the result of land formations and local irregularities.